I built this long-form digital presentation for The Tennessean to showcase a series of enterprise stories in conjunction with NCAA Women’s Final Four coverage. The ‘Legendary Ladies’ project contained eight video documentaries I produced on the area’s influential figures in women’s basketball, several stories from writer Mike Organ and hundreds of archive images. This video documentaries received a Multimedia award in the prestigious 2014 Associated Press Sports Editors Contest. 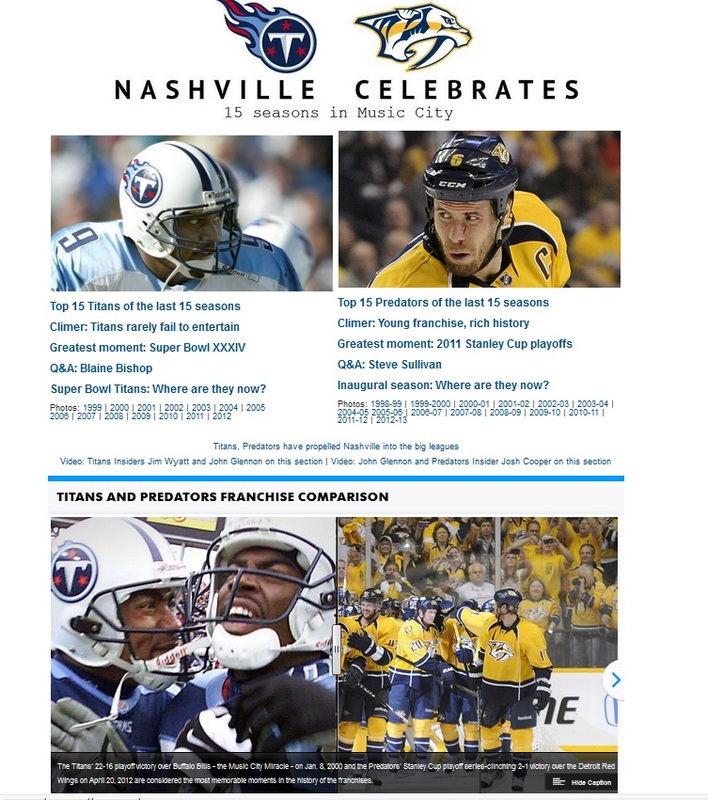 Digitizing The Tennessean’s special section on the 15-year history of the Tennessee Titans (NFL) and Nashville Predators (NHL) is another project I’m especially proud of. Taking all of the fantastic print elements and integrating for the website was a challenging, yet rewarding project. It required displaying several stories, hundreds of photos, videos and a special interactive graphic. My design philosophy for this project was simple: give equal weight to both franchises while keeping it contained on one page (with minimal mouse scrolling) and easily digestable for the digital reader. This is the screenshot of the special landing page for the digital project.